Thanks for following along for the past 24 days as I’ve opened and built the models for the 2011 City and Star Wars Advent calendars. Now that I’ve opened all 24 days, let’s review what we have got. Click each little image to see a full size picture. Both calendars included a wide variety of minifigs and models. Here you see the models organized by type. 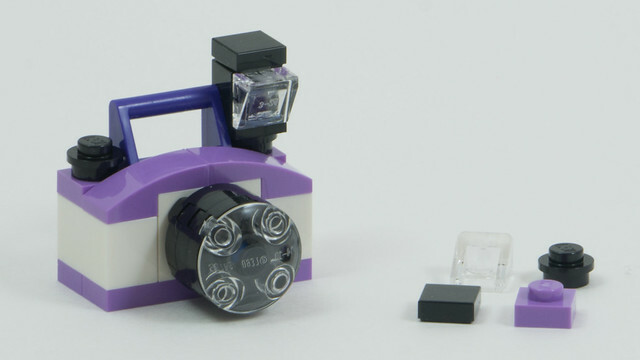 There were also a lot of extra parts – LEGO always includes an extra one of each of the smaller parts included in any set, and each of these daily mini-sets always came with extra parts just like any other LEGO set. The combined pile of City and Star Wars extra parts is pretty impressive. Day 24 of the LEGO City and Star Wars Advent Calendars for 2011. Merry Christmas Eve! Today is the final day of the Advent calendars. Both calendars give us Santa Claus. 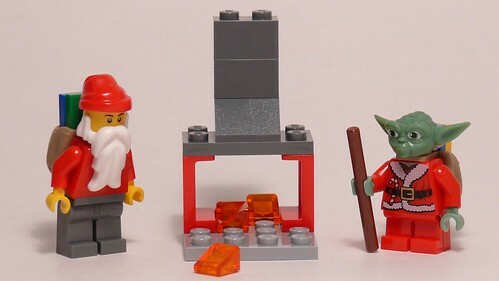 In City we have a traditional Santa Claus, the same way that LEGO has been producing him for years in Advent calendars. He has a sack on his back with presents (two 1×2 tiles) and the same hat and beard that they usually use. The torso is not printed, which I found a little disappointing. But we also get a cute little fireplace along with Santa complete with hot coals. 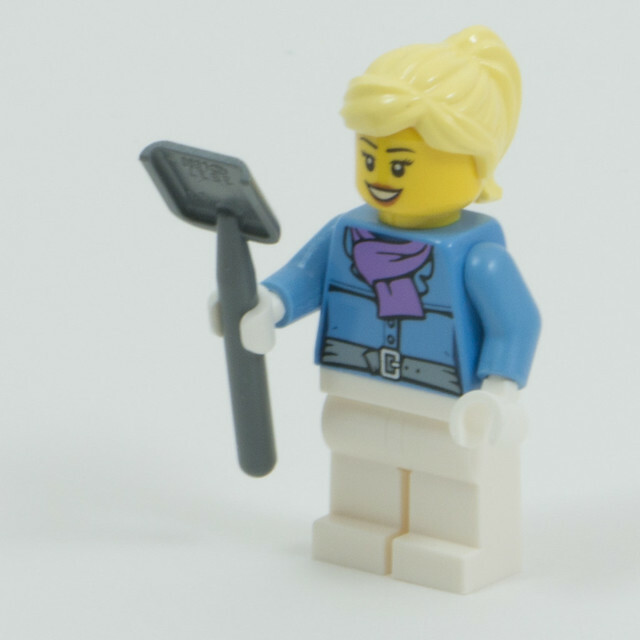 Some might say that was cheap compared to the flames that LEGO usually put into fireplaces, but to be honest coals are probably more accurate anyway. Star Wars brings us a cute Yoda Claus figure. Or is it Santa Yoda? Anyway, his head is very detailed, but rubbery – not the Yoda I have from older Star Wars sets. The cute printed torso is awesome, and they should have used the same torso in the City calendar if you ask me, just without the green hands. Day 23 of the LEGO City and Star Wars Advent Calendars for 2011. Merry Christmas Eve Eve! 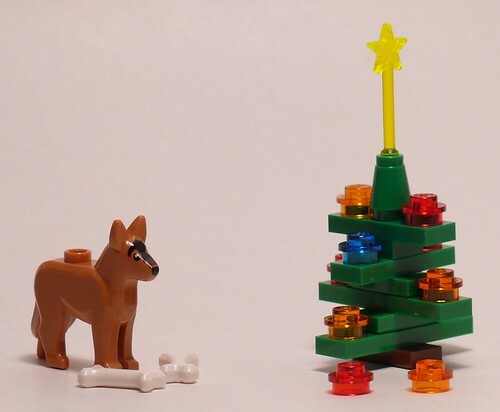 In the City calendar we get a dog and two bones. Three elements and one of them is extra. LAME. I like that it’s the new style of dog, but still pretty lame in terms of parts count. On the Star Wars side, we get a cute little Christmas tree made out of green plates. If you look carefully, you may notice the jumper plates are the new style, with the fingernail grooves. I guess they’re jumper tiles now. Tomorrow’s the last day of the advent calendar, Christmas Eve. I’ll be recapping the whole series, so check in to see what we ended up with! Day 22 of the LEGO City and Star Wars Advent Calendars for 2011. Happy Solstice! City brings us another snowmobile, this one themed in blue and white … a police model, perhaps. 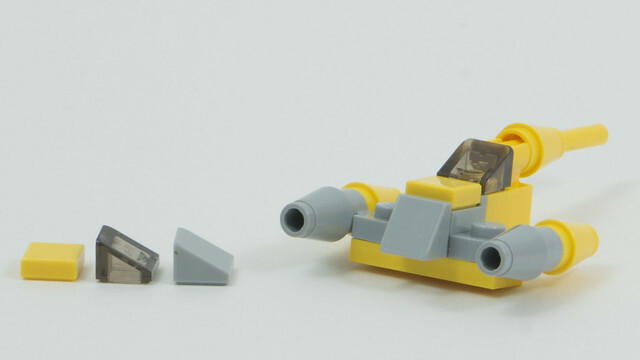 In Star Wars we get another cute little mini ship, the A-Wing (seen in Return of the Jedi) but I don’t think this one is nearly as good as the ones we’ve seen before. It’s just a few parts and I don’t really think it’s as well done as some of the others. Compare it to the Snowspeeder for example. 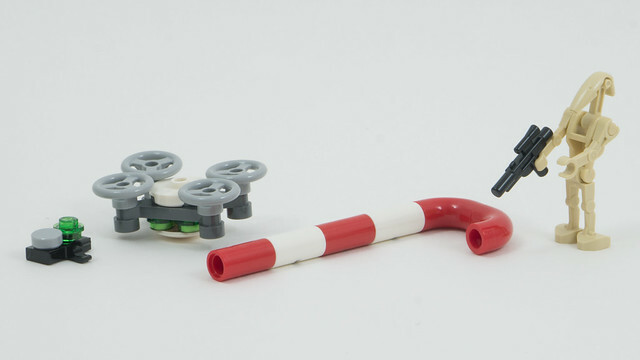 Day 21 of the LEGO City and Star Wars Advent Calendars for 2011. In City, we have a trailer for yesterday’s snowmobile. Day 19 of the LEGO City and Star Wars Advent Calendars for 2011. In City we have a safe, which our crook is undoubtedly hoping to pry open, by driving his stolen police car to the bank and using his crowbar. Star Wars gives us an Imperial Stormtrooper who has been working in the coal mines. Or a TIE pilot. Day 18 of the LEGO City and Star Wars Advent Calendars for 2011. 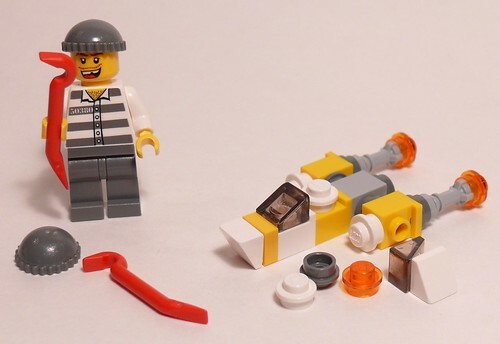 Today, we have in City a crook with a crowbar, preparing to break into and steal the police car, no doubt. 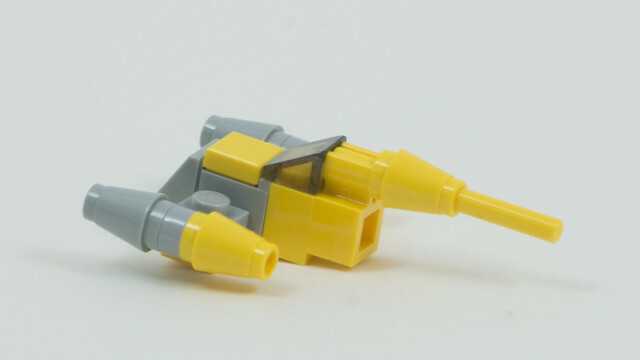 Star Wars brings us another sweet micro ship – this time the Y-wing…. 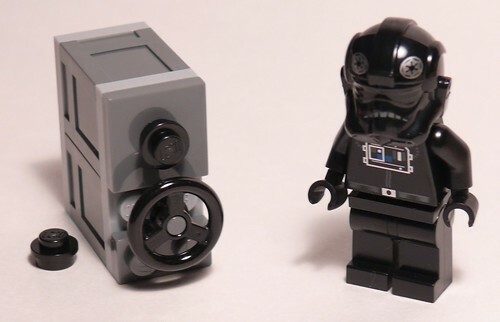 or maybe it’s another minifig scale UCS model?